Discussion in 'Buckeye Alumni' started by Buckskin86, Sep 25, 2009. July, 2009: Scott is an outstanding floor general. Scott pushes the ball in transition and finds open teammates for easy baskets. His excellent handle makes him difficult to defend as he can go right or left to beat you off the dribble. Scott uses a rhythm dribble to set up the defender before he makes his move to the basket. Scott likes to turn the corner off the high ball screen and looks to finish or kick out to an open teammate for the shot. He handles the ball well with both hands and has great control of his body. He does not put himself or his teammates in bad positions on the floor. He does not wow you with incredible quickness but gets by his man and makes the right pass or finishes the play himself. The cerebral guard is constantly communicating with his teammates and is the established leader on a talented team. May, 2009: Scott is a great athlete with great blood lines (Former NBA player Charlie Scott is his father). Scott understands how to play and is a good decision maker in both transition and half court settings. He is a good communicator who is an extension of the coach on the floor. He's got great ball quickness and a quick first step that he uses to get by his defender. He can get into the paint at will and understands how to penetrate and pitch. He is patient in feeding the post waiting for his teammate to seal his defender before delivering the ball. He consistently made free throws at the end of games and is difficult to press. Defensively he has great lateral quickness, is tough on the ball defender, and is fundamentally sound away from the ball. He can shoot it from three and is great in transition at getting to the rim and finishing. 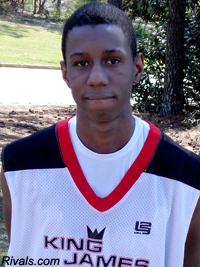 Another visitor this weekend, according to Scout.com, is 2011 point guard Shannon Scott of Alpharetta, Ga. (Milton), son of former North Carolina and NBA guard Charlie Scott. Scott, 6-1, has offers from at least a dozen major programs but not one yet from his father's alma mater. He is described as the type of quick, pass-first point that coach Thad Matta prefers for his offense. sounds like a good prospect, lets get him. one time. Shannon Scott, a 6-2 setup man from Alpharetta, Ga. (Milton), was on the OSU campus for the football game against Illinois on Sept.26 and Matta has made two visits to watch Scott play in open gyms this fall. Scott is the son of former North Carolina and NBA guard Charlie Scott. The Tar Heels "are interested" in the younger Scott, his high school coach, David Boyd, told MaxPreps.com, "but they already have a long line of point guards, and at Ohio State he can step in and play. Plus, they have an unbelievable recruiting class (coming in in 2010).? Alpharetta, Ga., point guard Shannon Scott, son of former North Carolina and NBA player Charlie Scott, reportedly has Ohio State No. 2 on his recruiting list behind Clemson. Scott, a member of the 2011 class, told reporters this past summer that his top three were Clemson, Ohio State and UCLA, in that order, and he recently affirmed that with Rivals.com -- although he added that Alabama and Connecticut have joined the hunt. Scott also took a visit with two of his teammates, Dai-Jon Parker and Julian Royal -- all are among the nation's top-50 players -- to Northwestern in August. i guess if he wants to go to clemson and fall apart during the second half of the season so be it. i really hope he comes to osu, but if not gl to you sir. Welcome to the family, Shannon! If someone else could post the articles, that would be great.